Virginia Tech (15-2, 4-1) will travel to North Carolina (14-4, 4-1) for a Big Monday matchup on ESPN in the Dean Dome. Both teams will be looking to add to their NCAA Tournament resumes, and both teams come into this game as part of a 6-team tie for first place in the ACC. Through five ACC games, North Carolina has played better on the road than they have in Chapel Hill. However, quick turnaround games always favor the home team because the visiting team has to travel and doesn’t have sufficient time to prepare. The Hokies played late Saturday afternoon, and then traveled to Chapel Hill on Sunday evening. Four of UNC’s five starters have started all 18 games, while the fifth has started 17 games. G Coby White (6-5, 195, Fr. ): 14.2 ppg, 66 assists. White was a 5-star recruit from the state of North Carolina who has moved into the starting lineup as a freshman. G Kenny Williams (6-4, 185, Sr.): 8.9 ppg, 72 assists. Williams is from the Richmond area, and he was a 40.2% three-point shooter a year ago. However, that number is down to 28.8% as a senior. His overall field goal percentage is down from 48.6% to 40.7%. G Cameron Johnson (6-9, 210, r-Sr.): 15.9 ppg, 5.7 rpg, 23 steals. The Pitt transfer is UNC’s leading scorer. Despite his height, Johnson has guard skills. He’s a 47.3% shooter from three-point range. F Luke Maye (6-8, 240, Sr.): 14.4 ppg, 10 rpg. Maye is a rugged post player for the Heels who does the dirty work on the glass. He’s a solid scorer who can step out and hit three-pointers. Like Williams, his shooting has dropped off this year. He was 43.1% from three-point range a year ago, but just 31.3% this year. F Garrison Brooks (6-9, 230, So. ): 8.2 ppg, 5.8 rpg. Brooks has started all 18 games for the Tar Heels, and plays just over 20 minutes per game. He is not an outside threat, having not attempted a single three-pointer this season. UNC’s top bench player is Nassir Little (6-6, 220, Fr.). He’s averaging 9.9 points and 4.3 rebounds per game in his 18.8 minutes. Little was a top five recruit in this past year’s recruiting class. As usual, Carolina has plenty of height at every position on the court. Virginia Tech’s job is made even more difficult by the probable loss of backup center PJ Horne against Wake Forest. There has been no announcement from the basketball program, but it’s likely that Horne will miss Monday night’s game against the Tar Heels. 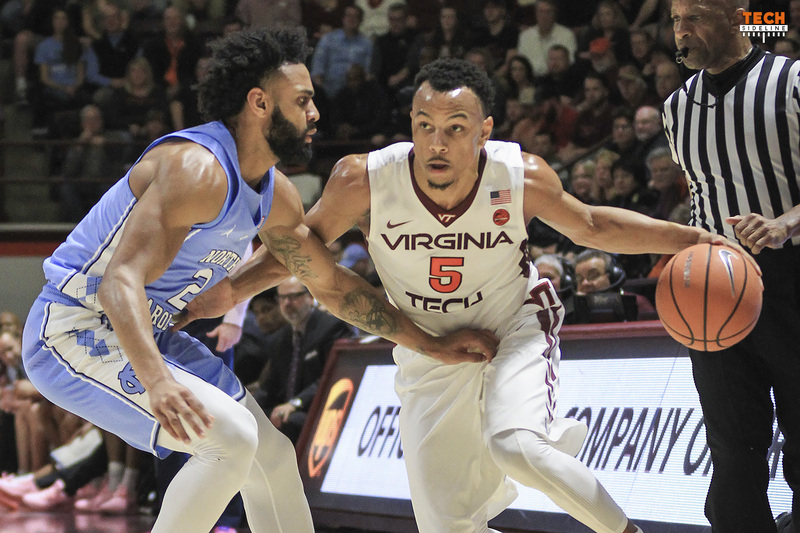 A big key for the Hokies will be limiting UNC’s offensive rebounds. The Tar Heels are one of the best offensive rebounding teams in the country, and Virginia Tech lacks size. When Tech beat UNC 80-69 in Cassell Coliseum last year, the Tar Heels scored just 11 second chance points on 10 offensive rebounds. Meanwhile, Tech had nine second chance points on 10 offensive rebounds. The Hokies were able to basically break even in a part of the game in which they were at a big disadvantage. If they can do that again tonight, they’ll have a chance to beat UNC for the second time in as many seasons. These top 20 ACC matchup are when we miss Chris Clarke the most. His energy and athleticism made a big difference in these big games. As Buzz has said on several occasions —our margin for error in the ACC is very thin. I love this team but CC gave us a little extra margin in these tough games. So, what happened to Horne? 3 of our next 4 games are on the road. Still hoping for a good shooting performance away from home to feel like we can finish better than 10-8 in ACC. Why is it that while points and rebounds are listed as averages but assists frequently are not? I get the stats right off the team’s stats page, and they all list totals for everything except points and rebounds. I really have no idea why it’s done like that. But I just copy it, so I don’t have to do the math. Thanks, I don’t blame you. Rebounding = height/length + technique + desire. We know VT lacks the first, but do not seem to have much of the 2nd or even the third so far this season, which would not seem to bode well…but that’s why you play the game. GO HOKIES! Didn’t UNC have to travel to Miami Saturday? If so hopefully they come in more weary than us.